With the size of Disney World, it's not surprising that there are paths inside each park (and even between the parks) that can help you get from point A to point B a little bit easier. 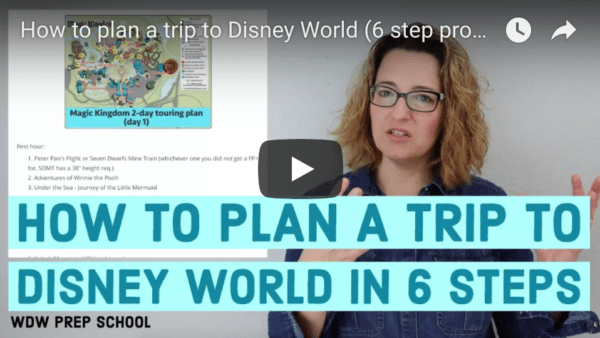 Not only do these routes help you save a few steps, some of these shortcut paths at Disney World will also help you avoid crowds. One of the least known shortcut paths at Disney World, this path connects the Fantasyland train station and Space Mountain and is a favorite path to cut down on some walking. Since the train doesn't stop in Tomorrowland, this is a handy way to get from Fantasyland to Tomorrowland if you do take the train. FYI: part of this path is a designated smoking area. In the Magic Kingdom touring plans, we frequently suggest going from Haunted Mansion to Splash Mountain, and you can go along the waterfront path on the water to do that. Not only is it usually less crowded, but it's also scenic and mostly shaded, making it a nicer route to get over there. 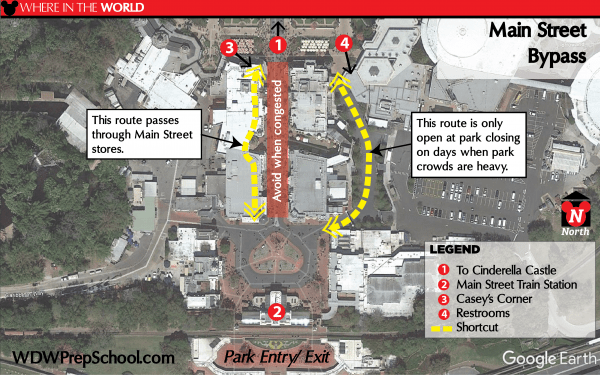 This path is also a good option during the parades since they'll have the main pathways roped off. You can cut between Adventureland and Frontierland halfway in-between the two using a couple of different paths, which can save you a lot of steps if you're wanting to move between these areas. One of the paths looks like a solid building on the guide maps, but there's a pathway you can take. This is not only a time (and step) saver but you'll also find restrooms along the way. When going between Tomorrowland and Main Street, you can avoid the busy hub by cutting through the Tomorrowland Terrace restaurant area, which is also a nice break from the sun since it's a mostly covered path. Main Street can become quite congested and hard to navigate during parades; however, you can cut between the Hub and the area down by the Main Street train station by walking through the stores on the left-hand side (as you face Cinderella Castle). The stores on that side are all interconnected, and while it will still be crowded, it can be easier than trying to navigate a crowded sidewalk during a parade. In addition, using the stores as a cut-through is also a great way to get out of the weather and into some air conditioning, even if only for a little bit. During busy times of the year, Magic Kingdom will often open up an alternate path located behind the shops on the right-hand side of Main Street (as you face Cinderella Castle). This path bypasses Main Street entirely and is a much less congested way to exit, albeit a slightly less "magical" way, as well. The Odyssey building at Epcot used to be an attraction and it's now only occasionally used for special things. The pathway that goes by it is great for getting between Test Track and the World Showcase (plus there are nice bathrooms along the way that usually aren't very busy). 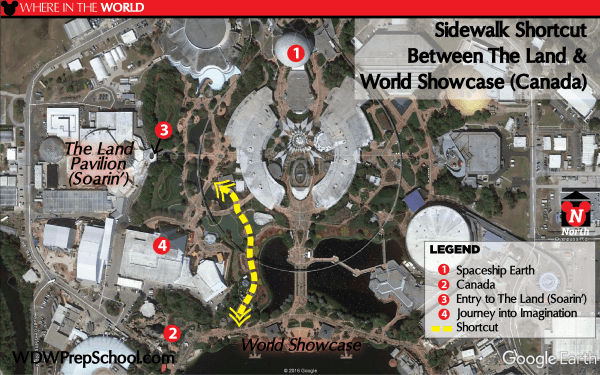 While not as lightly traveled as the Odyssey path, the sidewalk between The Land pavilion (where Soarin' is located) and The World Showcase (on the side where Canada is located) can save a lot of steps if you are headed between those 2 areas. Most people tend to tour Animal Kingdom in a circular manner by going from Africa to Asia to Dinoland (or the reverse), but there's a path right through the middle that can save some time, especially if you're going to It's Tough to be a Bug or want to see the Tree of Life up close. If you're entering on the side by It's Tough to be a Bug, you're basically entering the exit for that attraction, and then you'll have to find the opening that goes past the exit doors that takes you over to the other side. Beautiful path and lots of opportunities to take pics. Sometimes when you are visiting Epcot, depending on where you are headed it can be faster to make your exit out of the International Gateway and then catch a bus or a taxi/Uber from one of the nearby resorts like the Beach Club or Boardwalk. 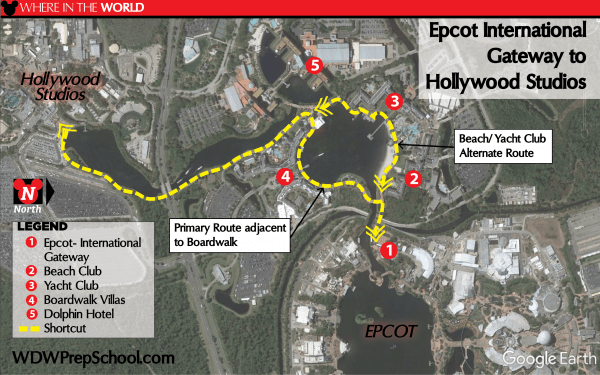 If you're hopping between Epcot and Hollywood Studios and don't mind a bit of a walk, you can easily do that, too, by following the path below. If you are a guest at the Contemporary or Bay Lake Tower and you are headed to the Magic Kingdom OR if you are heading from the Magic Kingdom over to the Contemporary, sometimes it is faster to just walk than to hop on the monorail (especially at park closing). Have questions about these routes? 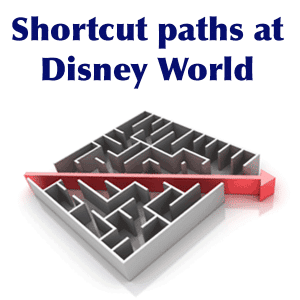 Or do you have other shortcut paths at Disney World you'd suggest? Feel free to leave your thoughts in the comments. 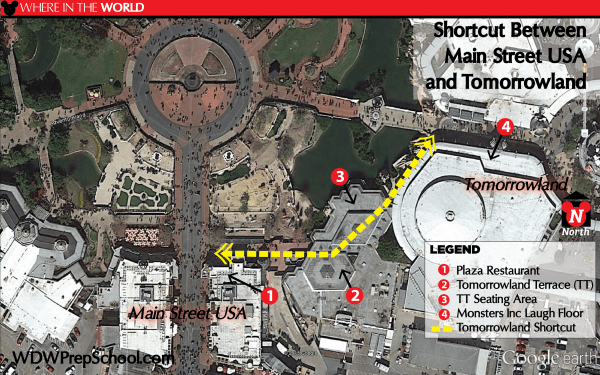 Is there a downloadable map / diagram of these short cuts that I can take to the parks with me. Is there a faster way to get from MK to Ohana Polynesian Resort ? 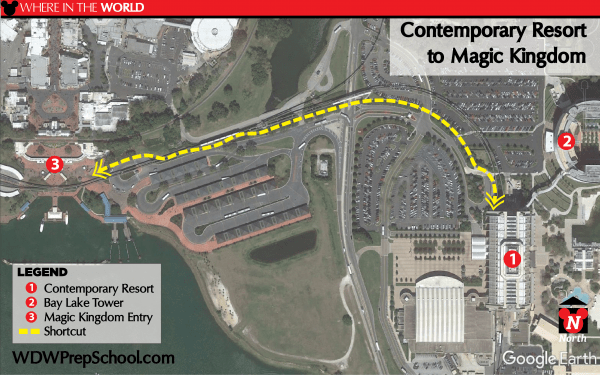 About how far is the walk from Contemporary to MK? Looks like Tron is going to go right where the Red Sidewalk is. If you are staying at a Disney Hotel, can you park at the Beach Club to go to Epcot The World and the Boardwalk? Or if you make a dining reservation there. The Cape May character breakfast works well for that. There is also a walking path between the TTC and the Polynesian, which can come in handy if you tour MK all day and then finish with dinner at Poly. Instead of using the monorail back to the TTC, you can just walk. You can actually cut through the Odyssey Center (there’s a bar there) and save more steps. Do you have a suggestion for the best way to take these shortcut tips with me to the park? What happened to the last 2 shortcuts? The article ends with Epcot Odyseey and leaves out AK and HS. I was hoping to figure out how to get from Fantasmic to the Star Wars fireworks quickly. They were removed because there is no show at Animal Kingdom right now and the shortcut for Fantasmic and Star Wars fireworks doesn’t work with the new show (because the ideal viewing spot is not the front of Hollywood Studios anymore, and Disney often schedules the two nighttime shows at the same time so you have to choose which to see). Another trick is when Main St. USA is crowded, duck into the shops on the left hand side, the Emporium. You can walk from shop to shop all the way down to Casey’s. If you are just looking to get where you are going and aren’t absorbing the thrills of Main St., this is a great (and air-conditioned) way to get by the crowds! At EPCOT, we also like to take the path from the Imagination Pavilion to them as World Showcase. It’s not exactly deserted, but it does reduce the walking when trying to get from that side of Future World to your dining reservation in Canada! Love these shortcuts, used all of them except the Tree of Life one, missed that. going again soon and will find it for sure. Thanks for the tips. Not many people know that you can leave Epcot between France and United Kingdom and take a boat to Hollywood Studios. The boat stops at a couple of hotels along the way but is still a short ride with a nice view. I “sort of” knew about the red sidewalk in the MK, b/c you can SEE it FROM the train, but I’ve never actually used it. I definitely didn’t know about the other path at the MK! Printable map would be sweet! Yes! That would be awesome!!! I would love a printable map of theses shortcuts also!!!? yes putting a binder together for our first trip and a printable map would be amazing! What about taking a screenshot of the images and saving to your phone for when you are in the park? I went last year for my first time and I accidentally took that EPCOT shortcut. I was wondering why it was not at all congested! These are great tips! I love the Epcot shortcut and use it often as that really cuts off a lot of walking time and takes you away from the more crowded walkway! Thanks! I never knew about the Animal Kingdom pass … where is that? And is it opened during all of the construction on the tree?